Panini America’s flagship Donruss Basketball franchise arrives in hobby shops across North America tomorrow boasting a bolstered jumbo format (30 cards per pack, 10 packs per box, 10 boxes per case), some funky fun insert designs, the first hard-signed rookie autographs of the new season and a hobby-exclusive insert roster that includes Retro Series, All-Stars, The Rookies, All Clear for Takeoff, Swishful Thinking and All Heart. 2018-19 Donruss Basketball also features the ultra-rare Charles Barkley SP insert that falls roughly once every other case. On average, each hobby jumbo box delivers two autographs and a bevy of vibrant inserts and parallels. 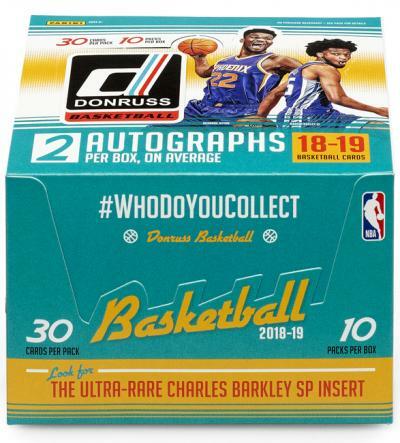 But for many basketball fans and collectors, the highlight of 2018-19 Donruss Basketball is the Next Day Autographs insert featuring hard-signed cards produced and signed during the 2018 NBA Rookie Photo Shoot. In case you missed it, we teased this year’s set back in August. We take a deep dive into 2018-19 Donruss Basketball in the revealing Quality Control Gallery below. Enjoy the sneak peek and stay tuned for additional coverage. 2018-19 Donruss Basketball will be available on the official online store of Panini America beginning at 12 p.m. CST tomorrow.